This text provides a basic treatment of modern electric machine analysis that gives readers the necessary background for comprehending the traditional applications and operating characteristics of electric machines—as well as their emerging applications in modern power systems and electric drives, such as those used in hybrid and electric vehicles. 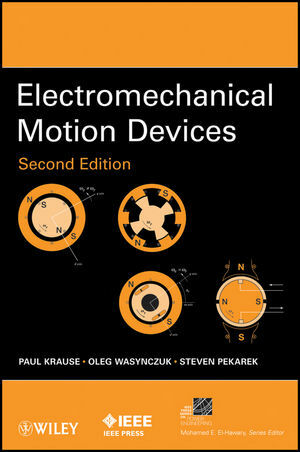 Thoroughly classroom tested and complete with a supplementary solutions manual and video library, Electromagnetic Motion Devices, Second Edition is an invaluable book for anyone interested in modern machine theory and applications. If you would like access to the solutions manual and video library, please send an email to: ieeeproposals@wiley.com. PAUL KRAUSE, PhD, is President and CEO of PC Krause and Associates Inc. He is a Life Fellow of IEEE and has authored or coauthored over 100 technical papers and three textbooks on electric machines. He was the 2010 recipient of the IEEE Nikola Tesla Award. OLEG WASYNCZUK, PhD, is a Professor of Electrical and Computer Engineering at Purdue University and serves as Chief Technical Officer of PC Krause and Associates Inc. He has authored or coauthored over 100 technical papers and two textbooks on electric machines. He is a Fellow of IEEE and was the 2008 recipient of the IEEE PES Cyril Veinott Electromechanical Energy Conversion Award. STEVEN PEKAREK, PhD, is a Professor of Electrical and Computer Engineering at Purdue University and is Chair of the Power and Energy Devices Area. He is an Associate Editor for IEEE Transactions on Power Electronics and IEEE Transactions on Energy Conversion.